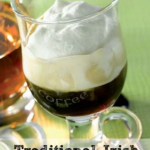 Looking for a traditional Irish Coffee recipe? You are going to love how simple it is to make this delicious Irish Coffee recipe. Even people who are not Irish know and love traditional Irish coffee. The Irish had the right idea when they combined Irish whiskey with hot, black coffee. 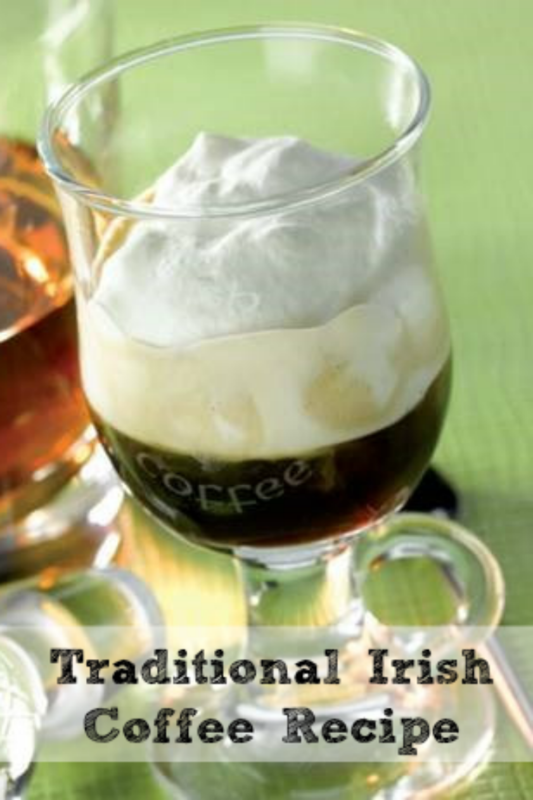 Traditional Irish Coffee is a hot cocktail that has been a long time favorite in Irish pubs but on March 17th, this beverage seems to be a fan favorite around the country. It is a nice treat to celebrate St. Patrick’s Day. This Irish Coffee pub style recipe is made the traditional way using brown sugar, whiskey and topped with whipped cream. It will warm you up on those chilly spring nights and will be a welcomed addition to serve your friends after having corned beef and cabbage. While the grown ups are enjoying their Irish Coffee, the kids can enjoy this simple non-alcoholic St. Patrick’s Day punch for kids. Make sure you have some special St. Patrick’s Day Desserts to enjoy. Whether you are making Irish Coffee for yourself or for a crowd, it is an easy recipe to make. Feel free to change up amounts. Some people might like a stronger Irish Coffee drink, other might prefer it weaker. Espresso is best but any strong coffee will do. I love me some whipped cream. You can make yours from scratch, like it is in this recipe, or use store bought. In a saucepan, heat the whiskey then incorporate the light brown sugar in order to dissolve it. Pour the mixture into a glass and pour the espresso on top. Lightly whisk the cream and sugar and arrange it carefully on top of the drink.